Moshe (Marvin) has lived in Israel for over 40 years, having immigrated from the United States with his wife, Danby, and two girls, with two sabra (Jerusalemite) boys joining the family shortly thereafter. He holds advanced degrees (M.A. & Ph.D) in Linguistics and Romance Languages from Harvard and the University of Wisconsin, as well as a Bachelor of Jewish Education degree from Boston’s Hebrew College. 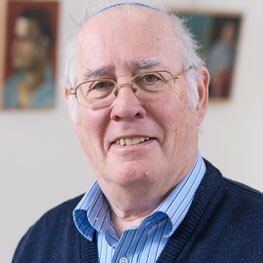 He has extensive experience in foreign-language teaching (Hebrew, English and Portuguese) both in Israel and abroad, conducting research on the dialects and Jewish communities of Brazil and Portugal (including Madeira). In addition, he is a member of the Jerusalem-based English-language theater groups JEST and Encore, having appeared in many of their productions. He joined Ulpan La-Inyan’s AACI Jerusalem branch in 2014, combining both his language training and theatrical experience to create a participatory “improv” dynamic in his classroom.